Are you unhappy in your relationship? Do you and your partner constantly fight? Has the person who's supposed to be your source of comfort, support, and joy become someone you both love and despise? What you're going through is well beyond the normal relationship challenges most people experience, because you're stuck in a dysfunctional relationship. You may also feel you're the only one this is happening to, that everyone else fares better with their partners, that there's something wrong with you, and worst of all that you deserve to be treated badly--because your partner has convinced, cajoled, bullied, and sometimes battered you into believing you're the cause. Fortunately, you're not alone, and help is here from someone who has lived what you're living. Thomas G. Fiffer, Executive Editor for The Good Men Project whose articles have over 5 million page views, has written extensively about dysfunctional relationships and gathered his wisdom in "Why It Can't Work: Detaching from dysfunctional relationships to make room for true love." The author survived two marriages defined--and ultimately destroyed--by dysfunctional dynamics and has learned how to break the patterns that prevented him from being happy and forming healthy emotional and romantic attachments. "Why It Can't Work" shows you how to recognize the problem, identify the source, and take decisive action--either to right your relationship or abandon it. Through an ordered sequence of enlightening articles collectively shared over 300,000 times on Facebook, the author gently but assertively reveals the painful truths about dysfunctional relationships, reminding us that romantic partnerships are supposed to be a healthy source of love and support, and letting us know it's OK to walk away when they aren't. If you or someone you know is involved in a dysfunctional relationship, reading "Why It Can't Work" will light the way back to happiness and peace. If you'd like to purchase "Why It Can't Work" or enjoy an instant preview, click on the links below. Does love really need a definition? The idea of love is innately familiar and intimately understood by everyone. But the practice of love, the act of loving, and the art of creating a loving relationship—these are things people need help with, and that’s why everyone needs What Is Love: A Guide for the Perplexed to Matters of the Heart. Thomas G. Fiffer has experienced love and heartbreak. 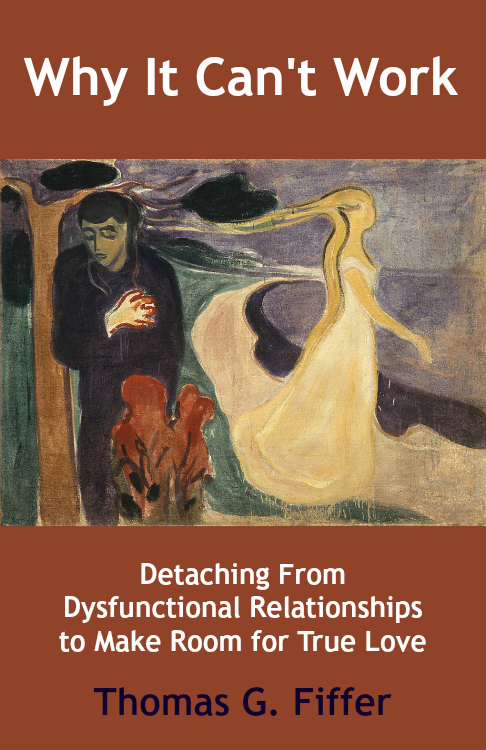 The chapters here, drawn from material he's published on The Good Men Project, will help readers understand when they’re experiencing love and when they're involved in other, love-imitating dynamics such as attachment, need, and codependence. The book serves as a trusted guide through our inevitable journeys in and out of romantic relationships—whether you’re looking for love, needing to know if you’re in love or in lust, wanting to keep your relationship thriving, or wondering if it’s time to leave. Life is fuller if you keep your heart open along the way. This book is both eye and heart-opening, and it also stops you from giving the keys to your heart to anyone who doesn’t deserve them. You will come away from reading What Is Love prepared to experience all the joys that love has to offer. "When I first picked up this ebook, I thought this compilation of articles would be a quick, easy read. I soon realized that it was much more than that as I kept stopping to take stock of myself and contemplate deeply new directions for my life. Just a few sentences or a turn of phrase would ring through me and make me think “That is so true, but I never looked at it that way.” Tom Fiffer has a way of stripping down the dynamics of dysfunctional relationships with brilliant clarity. That’s really the gift I was looking for in reading this book-a little clarity about complex, confusing situations with people I love. I wanted to know if something admittedly wrong in my relationships was because there was something very wrong with me. I’ve always believed in the power of love and wondered that if I was giving every ounce of love I had to my relationships why they didn't seem able to work. Tom Fiffer breaks down the negative patterns for me in this book, and he does it with all the love in the world.